There are various unforeseen cases, when medical help may be urgently needed. In traditional Chinese medicine, there are seven magic points, working on which you can help your body in a critical situation. According to traditional Chinese medicine, biologically active points (Suway) are located on the energy meridians (Jinglo) on the body. Each of the main meridians is connected with the body and together they form a unified system. By acting on biologically active points on the meridians, a person can influence the functions of the organs. The points can be influenced by the method of acupuncture or acupressure, pressing with your fingers. In some cases, when there are no drugs or a doctor near, pressing on biologically active points can save a life or simply get rid of a malaise. Harmonizing points are located at the beginning and at the end of the meridians. Pressing on them contributes to the harmonization of the work of all organs controlled by this meridian. Stimulating points are located on each meridian. Pressing on them activates the energy reserves of the body. Soothing points counterbalance the functions of the nervous system. Stimulation of them causes a particularly pleasant sensation. Each internal organ has its own alarm point. Correct acupressure of these points reduces suffering, calms the pain. Special points are used according to certain rules for the treatment of specific diseases. Each organ of the human body is associated with certain acupressure points. The disorganization of the work of each organ affects the condition of the associated point, which often facilitates the correct diagnosis. For example, with diseases of the stomach, pain is observed at the point on the abdomen, with kidney diseases - at the point on the waist. Pressing on these points in the early stages of the disease can normalize the condition of the organ. This is a general rule: if you feel pain at some point with a slight pressure, you should massage it. As the long-term practice shows, acupressure does not give harmful consequences and complications. For acupressure, choose the right time, be sure that you are not disturbed by relatives, phone calls and other distractions, sit or lie down, calm down, relax. The area to be massaged is about a centimeter in diameter. Prepare to perform the procedure, easily put your index finger at the appropriate point on the skin and, gradually increasing the pressure, rotating clockwise, massage this point. #1. He Gu. Determine the highest point located on the back of the hand in the cavity between the thumb and the second metacarpal bone. Now, massage it for four to five seconds. This technique will help you get rid of face pain, toothache, headache, neck pain and stress. Massaging the point with the middle finger and thumb will make you feel better and help you reduce various pains in the body, as well as stress. #2. Jian Jing. Massage this point on the shoulder with both the middle and index fingers. If you suffer from chronic pain and body aches, it can make you feel better. It will help you calm down if you have just experienced a lot of stress. #3. Tai Chong. 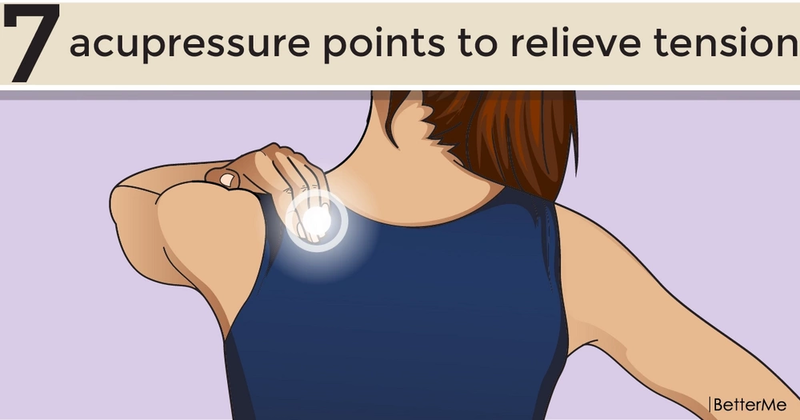 The pressure on this point will help you solve a number of health problems, such as anxiety, limb pain, high blood pressure, menstrual pain, insomnia, stress and low back pain. #4. Feng Chi. These points are located under the occipital bone about 2.5 cm above the rear border of hair growth in the pit at the outer edge of the trapezius muscle, where the deepening is. #5. Zu San Li. This point will help you get rid of fatigue, stress, gastrointestinal discomfort, vomiting and nausea. Women can also ease the pain in dysmenorrhea in this way. With the thumb pads, lightly press and massage the point until the sensation of numbness. #6. Shen Men. According to experts, this is one of the most important points in the human body, with the help of which it is possible to get rid of stress. #7. Stomach point. Having freed the diaphragm and chest, this point improves the whole process of breathing and you will feel a great relief.